ENCINITAS — An opponent and proponent of Proposition A debated the measure, due to go before voters June 18, last week at a Leucadia Town Council meeting. Prop A reaffirms the city’s 30-foot height limit and would eliminate council’s power to “up-zone” beyond permitted height and density with a fourth-fifths vote. At least 5,700 registered Encinitas voters signed Prop A last year, qualifying the initiative for a special election. But Steve Shackelton, a local architect, said that most of those who put their name on the initiative meant well, but didn’t understand its full ramifications. For one, he said buildings that measure higher than 30 feet are allowed in select parts of the city, referring to “specific plans.” If Prop A passes, proposed buildings greater than 30 feet in the specific plans would go to a public vote, making new businesses less likely to consider Encinitas because of the added difficulty. “This needed flexibility to compose interesting and new architectural styles is a benefit to our community,” Shackelton said of the specific plans. 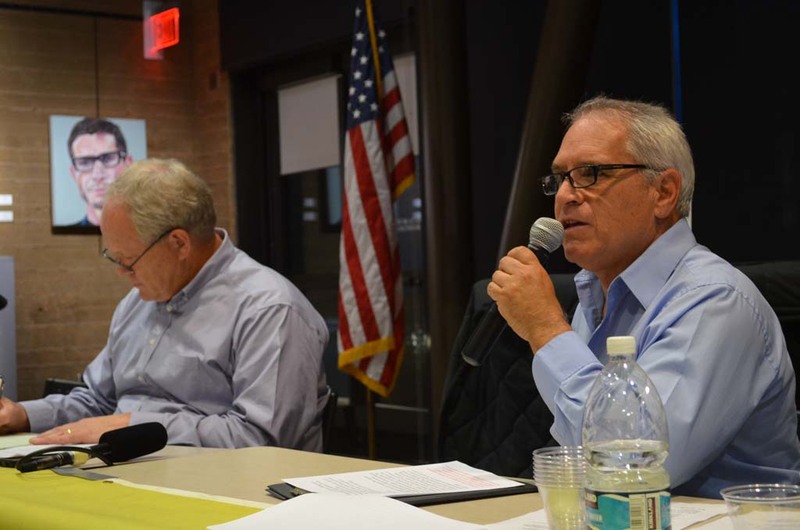 Bruce Ehlers, the spokesman for the initiative and a former city planning commissioner, countered that he “trusts the voters” to decide which projects should be approved. As another example, he cited voters denying Ecke Ranch’s request to rezone 38 of its 68 acres from agricultural to residential in 2005. “Zoning is the prescribed method of protecting the character of our community,” Ehlers said. But Shackelton said Prop A would put too many projects to a vote, gumming up the city’s planning department. Further, he accused Prop A backers of misleading voters by putting up posters around the city showing a five-story building towering over homes. “There are no five-story buildings planned to be built next to residential homes,” Shackelton said. Ehlers maintained that five-story buildings are still a possibility. He noted that draft language from a citizen group tasked with informing the City Council on housing included language about building four or five story buildings in select locations. For now, the language is off the table. But Ehlers said: “it can just as easily be brought back on.” He added the initiative is key to protect residents from the “ebb and flow” of city government. The debate also touched on the 1,300 state-mandated housing units Encinitas is planning for. Shackelton said a small number of high-density projects, in the right locations, could help meet the goal. But Prop A would give the city less flexibility, because building these projects within current height and density limits “just doesn’t pencil,” Shackelton said. Although Prop A doesn’t specifically address housing mandates, Ehlers was less concerned about the state’s requirement. Planning for it is “unending,” he said. “We will increase our density to meet the regional housing numbers, and then in the next round, we get another edition,” Ehlers said. “Tell me — where is that limit?” Ehlers asked. The special election for Prop A will cost $400,000.